The largest arms exports contract in Canadian history will see Canadian-made military equipment shipped to one of the worst human rights violators in the world — Saudi Arabia. 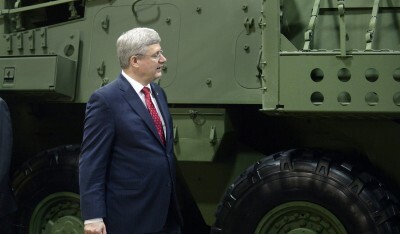 This will happen despite an existing export control regime specifically intended to prevent Canadian goods from fuelling human rights violations abroad.The deal was brokered by the Canadian Commercial Corporation (CCC) — a taxpayer-financed Crown corporation — for an undisclosed number of Light Armoured Vehicles to be manufactured by General Dynamics Land Systems (GDLS), based in London, Ontario.While many details of the deal remain shrouded in secrecy, below are 10 indisputable facts. Fact 1: The deal is, by far, the largest military exports contract in Canadian history. The contract, valued at $14.8-billion, was awarded during the 2013-2014 fiscal year. It dwarfs any other military exports contracts brokered by the CCC — ever. With the total value of all military export contracts for 2013-2014 at $15.5-billion, the Saudi deal accounted for more than 95 percent of military exports for the fiscal year. Fact 3: Saudi Arabia is one of the worst human rights violators in the world. By any modern standard, Saudi Arabia is a human rights pariah. According to Washington-based Freedom House, the country is among the “worst of the worst” human rights offenders in the world. Year after year, authoritative organizations such as Amnesty International and Human Rights Watch condemn the consistent, systematic repression of the Saudi civilian population by the governing regime. Beheadings are routine; an October 2014 Newsweek feature story was entitled “When It Comes To Beheadings, ISIS Has Nothing over Saudi Arabia.” Posting online comments critical of the regime can result in the author being publicly flogged. Women cannot drive. Freedom of speech is severely censored. Freedom of association, freedom of the press, and academic freedom are restricted. Hundreds of thousands of websites have been blocked. The state imposes harsh penalties, including beheadings, for crimes such as witchcraft, apostasy, sorcery, and fornication. If a country with Saudi Arabia’s dire human rights record is deemed eligible to receive Canadian-made military goods, it is hard to comprehend what sort of record a country must have to actually trigger the pertinent human rights safeguards. Fact 4: Documentary evidence shows that the Saudi regime uses Light Armoured Vehicles against civilians. In March 2011, Saudi Arabia sent armoured vehicles to help quell peaceful civilian protests in neighbouring Bahrain. One of several media outlets that made such claims, Britain’s Telegraph reported that Saudi troops were in Bahrain to “crush” the protests. Fact 5: The necessary export permits had not been issued when the deal with Saudi Arabia was officially announced. Project Ploughshares has established that at the time that the Saudi deal was announced in February 2014, the required export permits had not been issued. This is especially significant, as a key element of the export permits is a human rights assessment to determine that the deal in question does not contravene Canada’s export control policies. We need to ask: Was the announcement of the sale made on the assumption that the export permits would eventually come through? What was this assumption based on? Would any reasonable observer not find this assumption highly risky, given what is known about the recipient nation? Fact 6: The deal was announced without a single reference to the human rights situation in Saudi Arabia. When Minister for International Trade Ed Fast made the official announcement that General Dynamics Land Systems had won “the largest advanced manufacturing export win in Canada’s history,” it was framed as an economic victory for Canada. References to job creation and a “cross-Canada supply chain” constituted the primary talking points. The announcement said nothing about the dire human rights situation in Saudi Arabia or the necessary export permits. Fact 7: Information on how Ottawa justified the deal has not been made available to the Canadian public. No human rights reports for 2014, the year in which the deal was announced, or the 2013-2014 fiscal year, when the CCC awarded the contract to GDLS, were produced by Foreign Affairs, Trade and Development Canada. Further, DFATD will not divulge details of the export permit application process, citing commercial confidentiality. Fact 8: More than a passive intermediary, the CCC is an active promoter of military exports. Fact 9: Other developments, such as the expansion of the Automatic Firearms Country Control List, point to the erosion of military export control standards in Canada. The Automatic Firearms Country Control List (AFCCL), which was designed to restrict the foreign market for Canadian-sourced automatic firearms, is becoming less and less restrictive. As only countries on the list can receive Canadian firearms, countries have been added to the list as potential markets and lucrative deals have emerged for Canadian-made weapons — and as old, trustworthy clients have cut back on their purchases. The number of countries on the AFCCL has tripled — from 13 to 39 — since it was established in 1991. Fact 10: Canada’s minority position as a non-signatory to the Arms Trade Treaty denies it a voice in a critical international process to better regulate the arms trade. The Arms Trade Treaty (ATT), which came into force in December 2014, is widely seen as a major diplomatic achievement, as it seeks to regulate the global arms trade and prevent military exports from fueling human rights violations and armed conflict. A key feature of the treaty is the expectation that arms deals be conducted with the utmost transparency, so that the risk of human rights violations by the end users can be easily assessed.The historic First Conference of States Parties to the Arms Trade Treaty was held on August 24-27 in Mexico. Crucial decisions were made on the treaty’s rules of procedure; financing mechanisms that will ensure its sustainability; decision-making rules, such as voting thresholds for procedural and substantive matters; the location, makeup, and role of the ATT secretariat; and the rights and responsibilities of states, industry, and civil society during subsequent meetings of states parties.What say did Canada have on these consequential matters? None. Canada is the only country in North America, the only member of the G7 group of industrialized nations, and the only one of the 28 members of the North Atlantic Treaty Organization that has not signed the Arms Trade Treaty. Other non-signatories include South Sudan, North Korea, Somalia, Pakistan, Syria, and — perhaps not surprisingly — Saudi Arabia.Cesar Jaramillo chairs a discussion on “Canada and the global arms trade” Sept. 21 in Waterloo.